The new time-saving revolution in drug discovery. Combinatorial chemistry, a method for synthesizing millions of chemical compounds much faster than usual, is becoming one of the most useful technical tools available to chemists and researchers working today. Using current advances in computer and laboratory techniques, combinatorial chemistry has freed professionals from the drudgery of piecemeal experimental work and opened new creative possibilities for experimentation. * Combinatorial libraries of peptides, proteins, and antibodies using biological systems. While combinatorial chemistry originated in peptide chemistry, this volume has deliberately focused on nonpeptide organic applications, illustrating the technique's wide uses. 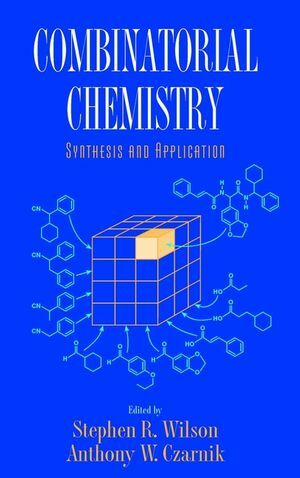 Combinatorial Chemistry introduces organic, medicinal, and pharmaceutical chemists as well as biochemists to this exciting, cost-effective, and practical technique, which has unlocked creative potential for the next millennium. Stephen R. Wilson is Professor of Chemistry at New York University. He is also founder and President of Sphere Biosystems, Inc., in New Jersey, a biotech company based on fullerene combinatorial chemistry technology. Anthony W. Czarnik is Senior Director of Chemistry at IRORI Quantum Microchemistry in La Jolla, California, and formerly Director of BioOrganic Chemistry at Parke-Davis Pharmaceutical Research. Parallel Organic Synthesis Using Parke-Davis Diversomer Technology (S. DeWitt & A. Czarnik). Polymer-Supported Synthesis of Organic Compounds and Libraries (M. Kurth). Macro Beads as Microreactors: New Solid- Phase Synthesis Methodology (W. Rapp). Combinatorial Libraries in Solution: Polyfunctionalized Core Molecules (E. Wintner & J. Rebek). Solid-Phase Methods in Combinatorial Chemistry (I. Sucholeiki). Combinatorial Synthesis Exploiting Multiple-Component Condensations, Microchip Encoding, and Resin Capture (R. Armstrong, et al.). Indexed Combinatorial Libraries: Nonoligomeric Chemical Diversity for the Discovery of Novel Enzyme Inhibitors (M. Pirrung, et al.). Combinatorial Libraries of Peptides, Proteins, and Antibodies Using Biological Systems (S. Benkovic, et al. ).